Easy Installation, no bubbles, no peeling corners, no hassle. Oleophobic coating prevents fingerprint smudges. Anti-scratch, impact resistant, 9H hardness rating. Retains screen clarity and touch sensitivity. NOTE: Due to the curved-edge screen of the Galaxy S9 Plus, our screen protector is made to be smaller than the actual screen of your device. This is to prevent the protector from overlaying these curved edges which can lead to unwanted bubbling and peeling up around the edges. 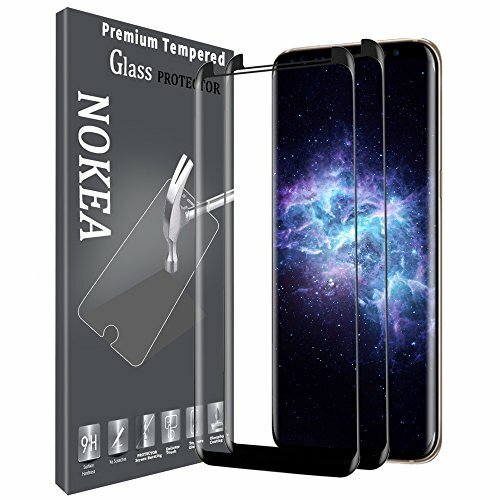 This product comes with limited lifetime warranty which guarantees protection on quality related issues for your purchase of Tempered Glass Screen Protector by NOKEA for the Samsung Galaxy S9 Plus. Specifically Designed for Samsung Galaxy S9 Plus. Please make sure your phone model. Made with 3D Curved Edges to protect your screen from edge to edge. Our premium glass screen protector is made to protect your phone's screen from scratches and other external damages. Highly durable, ultimate shock absorption. 9H hardness provides protection against scratches and scrapes. Lifetime warranty, NOKEA lifetime no-hassle warranty with friendly customer service provides peace of mind for your tempered glass screen protector. If you have any questions about this product by NOKEA, contact us by completing and submitting the form below. If you are looking for a specif part number, please include it with your message.